So, we’ve added KlickTel to our list of supported apps. KlickTel is an online telephone directory that gives you all of the information that you need, without you having any yourself. Let me explain. You receive an email from your secretary (as if anyone actually has one of those) that says that you are going on a business trip to Berlin for one week, but that you should look for a hotel that’s in the city center to cut down on travel time. You will have to organise your own travel plans for next week, as I was unable to reach anyone at the travel agency. You should book a city center hotel in Berlin, as per corporate policy. Just a quick reminder, that it is also corporate policy to take public transport whenever possible. I hope this helps. Since, I didn’t want to load my Friday up with work. (and no secretary) I decided I would use the new Klicktel feature from click.to. 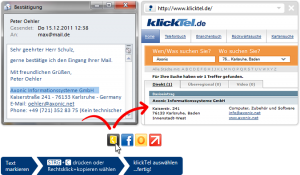 Here’s how it works: I highlighted directly from the email “city center hotel in Berlin” and click.to Klicktel. click.to automatically knows what I want and will put “city center hotel” in the “what” box and Berlin in the “where” box. Perfect! I get a couple returns on my search and choose the first one on the list. The cool thing with the list is that I can use one of our other partners (Skype) to complete the plans. I just highlight and copy the phone number and click.to Skype. The entire process took me less than 3 minutes, and that’s because I was on hold for a second with the hotel! I’m extremely happy that all of these programs work so great together, but I can’t help but wonder what my “Secretary” does all day? I guess it’s time for a performance review! As a side note, we are also currently trying to get in touch with yellowpages.com to see if they are interested in a similar integration with us. If any of you have contacts to the Yellow Pages, please let me know!